Much has been written about Flodden and how it was a catastrophic defeat for the Scots. There was much more to the campaign of August and September 1513 than one battle, disastrous for the Scots but a glorious victory for the English. It is the purpose of this paper to explore who took part on the Scottish side, how and why, and the routes they took to England.1 Although it is the author’s contention that fewer participated in the actual fighting than is normally supposed, there can be no reasonable doubt that events that autumn affected just about every community in Scotland. Few battles have had such a major impact on the psyche of a nation as Flodden, and for that reason it is worthwhile, 500 years on, attempting to understand what it was really like for our ancestors. The entire male population of the country between the ages of 60 and 16 could be called out to serve in the host, or Scottish army, for a maximum of 40 days in any one year. Some of those not assigned a place in the ranks may still have taken part in siege work and raids into the English countryside. Others would have swelled the numbers of the baggage handlers, camp-followers, etc, and many no doubt slipped away home. Contemporary reports on the Scottish army give a wide range of estimates of the number of fighting men from about 40,000 to over 100,000. The report written in the immediate aftermath of the battle by one of the English commanders, Sir Thomas Howard, for sending to Henry VIII, is especially interesting. He gives the Scottish army as 80,000 men, but then in the detailed account of what happened notes that the Scottish army was divided into five battles, and describes one, led by the Earls of Huntly, Errol and Crawford, as being 6,000 strong. Since all five battles would have been approximately of the same size, that would surely indicate that the army, on the basis of Howard’s reckoning, really consisted of 30,000 men, not the headline figure of 80,000 men.3 Even that figure of 30,000 is in the author’s opinion too high. An army nearer in size to 20,000, is more likely. The instructions issued by James IV on 18 May 1491 for the holding of wappenschaws (local musters and reviews of weapons and equipment) four times a year provides a guide to what would have been expected in 1513. Gentlemen with £10 worth, or more, of land were required to serve as men of arms, armoured and provided with a sword, a spear and a dagger. Gentlemen with less land, as well as respectable yeomen (tenants holding their farms directly from the land-owning classes, or the more prosperous farming folk in general), could also opt to serve as men of arms, while all other yeomen aged between 16 and 60, as well as burgesses and inhabitants of burghs, were to wear protective clothing, such as jacks and brigantines, and serve as archers or axemen, or else provide themselves with swords, bucklers (a type of shield), knives and spears.4 There is no mention of horses but it would clearly have been understood to contemporaries that men of arms went mounted, even if they did not fight from horseback. That medieval armies were accompanied by large numbers of non-combatants is a well known but little discussed fact. Their presence may explain many of the exaggerated figures for the sizes of armies. Individuals were required to provide their own food and equipment when they were called out. In practice, for a campaign like Flodden, it is probable that supplies of food, drink, fodder, etc, were pooled and carefully guarded against depredations by less well provided contingents. Local leaders possibly supplied much of the victual from their own resources. A significant amount of food may have gone on the hoof (cattle and sheep), thus adding to the scale of the host and congestion on the route ways. While we may suppose that this large assembly of men and beasts congregated on the Scottish bank of the Tweed and crossed the border en masse, it is clear that for much of their journey the constituent units travelled separately, often deliberately on different roads or spaced out to avoid congestion. Contingents came from all parts of Scotland to take part in the Flodden campaign. For many their journey would have been the first time they had left their immediate locale. For some, even to get to their regional muster point would have involved a trip of hundreds of miles. For example, the distance by road nowadays from Thurso on the north coast, the possible landing place for men from the Northern Isles, to Edinburgh is about 280 miles (448km), a distance that could hardly have been covered on foot in any less than two weeks and which would realistically have taken rather longer. Extrapolating information from other, better documented, late 15th and early 16th-century military campaigns, it may be supposed that towns like Stirling, Glasgow, Edinburgh, Lanark and Lauder would have been selected as regional muster points.11 To prevent congestion or bottlenecks a timetable may have been devised so that contingents which took the same road were separated out by a day, or at least several hours on their onward journeys to Ellem. Ellem, however, as a muster point makes most sense if a significant number of the contingents were heading for it by way of Edinburgh and Haddington. That might mean that any contingents assembling at Stirling, and possibly even Glasgow, would also have headed via Edinburgh and then on this route. The way from Stirling went via Linlithgow. There were several potential routes from Glasgow, all of which need researched. The last segment of the route taken by the whole army from Ellem to the English Border could have been a road now represented by the A6112 to Coldstream. The River Tweed may have been forded in the vicinity of Norham Castle, which was besieged and captured by the Scots. The uncertainty lies in what happened to Wark Castle. It appears to have been captured, and if that was by battery, it is possible that at least part of the army and the artillery train headed there first before being deployed against Norham Castle. If, as we have supposed, the artillery train had crossed the Tweed by bridge further upstream at Melrose, it would have approached Wark from the southwest via Kelso. At Kelso, rather than taking the bridge back across the Tweed, perhaps it could have crossed the River Teviot to take a more direct route into England. It is not known if there was then a bridge or a ferry across the Teviot, but in any case, this river was probably easier to ford than the Tweed further downstream. This would have meant the guns entering England from the English side of the Tweed, perhaps against English expectations. From Wark they could have readily carried on to Norham, crossing the River Till by the Twizel Bridge. It is known that at least some of the Scottish army was camped at Twizel Haugh on 24 August, two days after it had entered England and at a time when Norham Castle was probably already being besieged.15 Twizel Haugh is a spit of land between the confluence of the River Till with the Tweed, about 7½ miles (12km) from Norham Castle. It may have been the Scottish headquarters in the early stages of the campaign in England while siege work was being undertaken and raiding parties sent out. 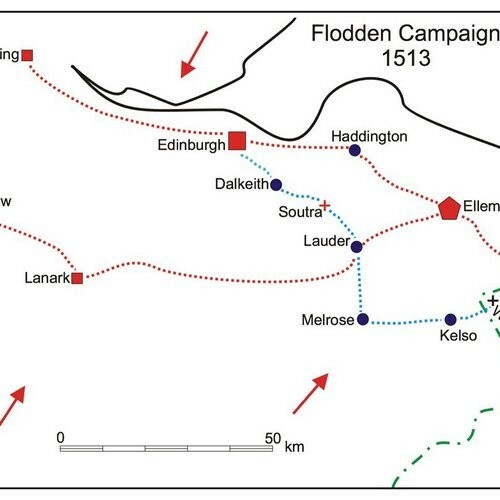 By 7 September, and probably several days before that, the Scots had taken up position on Flodden Edge.16 Despite the lack of documentation specifically relating to the Scottish mobilisation in 1513 it is clear that it was a complex business, but one that produced a large army from all quarters of the kingdom and an artillery train that was used effectively against major English fortresses. All this has been obscured by the subsequent disaster in the battle at Flodden. The artillery train was captured by the English, and perhaps some 5,000 or 6,000 left dead on the battlefield. For the survivors there were the long roads home, probably retracing the ways taken to Ellem at the beginning of the campaign, but, especially with the loss in battle of so many leaders, in less well ordered units. It was an adventure that would long stay in the memories of the survivors, not for the happiest of reasons. 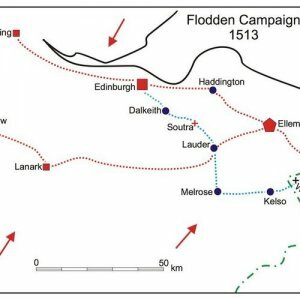 This article is a summary of a much longer research paper with the same title prepared in 2015 for the Flodden 500 project. It provides much more detailed information on sources and the reasoning behind the assumptions and guesses presented here for Scottish participation in the campaigning of 1513. It is available at www.flodden1513.com. See also Caldwell 2013. Mackenzie 1931: 54-56. Henry VIII Letters & Papers 1: no 2246. Cal State Papers Venetian 2: no 316; Mackenzie 1931: 71, 104, 113. Good recent research on some of these roads can be found, some of it based on field survey, online, for example at www.oldroadsofscotland.com. There are also notable local surveys by Hardie (1942), Inglis (1916 and 1924) and Graham (1960 and 1963). Perhaps the most valuable work on his subject is in RCAHMS’ Roxburgh Inventory (1956), in the case of Dere Street, extending into the neighbouring shires of Berwick and Midlothian. Inglis 1912, 1913 and 1915; Weir 1988. The author has particularly relied on documentation for campaigns in 1496, 1497 and 1523. Information on the first two of these can be gleaned from the Treasurer’s accounts (TA 1), and on the third from ADCP and Henry VIII Letters & Papers 3. Buchanan, History 2: 287; RCAHMS 1956, 2: 304. More information on these old roads can be found in a series of papers published by Graham in 1948, 1949, 1960 and 1963, and in Inglis 1916 and 1924. Hall’s Chronicle: 556-7; Mackenzie 1931: 36; Mackie 1958: 248. ADCP. Acts of the Lords of Council in Public Affairs 1501-1554, ed R K Hannay. Edinburgh 1932. Buchanan, History. G Buchanan, The History of Scotland, trans J Aikman. Glasgow & Edinburgh, 1827-9. Caldwell, D H 2013 ‘How Well Prepared was James IV to Fight by Land and Sea in 1513?’, Journal of the Sydney Society for Scottish History 14: 33-75. Cal State Papers Venetian. Calendar of State Papers and Manuscripts relating to English affairs, in Venice and other Libraries of Northern Italy, ed R Brown et al. London 1864-. Graham, A 1948 ‘The Roman Road to Raeburnfoot’, Proc Soc Antiq Scot 82 (1947-48): 231-4. Graham, A 1949 ‘An Old Road in the Lammermuirs’, Proc Soc Antiq Scot 83 (1948-49): 198-206. Graham, A 1960 ‘More Old Roads in the Lammermuirs’, Proc Soc Antiq Scot 93 (1959-60): 217-35. Graham, A 1963 ‘Archaeology on a Great Post Road’, Proc Soc Antiq Scot 96 (1962-63): 318-47. Hall’s Chronicle (by Edward Hall). London, 1846. Hardie, R P 1942 The Roads of Mediaeval Lauderdale. Edinburgh: Oliver and Boyd. Henry VIII Letters & Papers. Letters And Papers Foreign And Domestic of the Reign of Henry VIII, ed J S Brewer et al. London, 1862-1932. Inglis, H R G 1912 ‘Ancient bridges in Scotland, and their relation to the Roman and medieval bridges in Europe’, Proc Soc Antiq Scot 46 (1911-12): 151-77. Inglis, H R G 1913 ‘The roads and bridges in the early history of Scotland’, Proc Soc Antiq Scot 47 (1912-13): 303-33. Inglis, H R G 1915 ‘The most ancient bridges in Britain’, Proc Soc Antiq Scot 49 (1914-15): 256-74. Inglis, H R G 1916 ‘The roads that led to Edinburgh, etc’, Proc Soc Antiq Scot 50 (1915-16): 18-49. Inglis, H R G 1924 ‘Ancient Border Highways: the Minchmoor (Catrail) Road, the Wheel Causeway, the Annandale Forest Road, the Well Path and the Enterkin’, Proc Soc Antiq Scot 58 (1923-24): 203-23. Mackenzie, W M 1931 The Secret of Flodden. Edinburgh: Grant & Murray. Mackie, R L 1958 King James IV of Scotland. Edinburgh: Oliver and Boyd. RCAHMS 1956 An Inventory of the Ancient and Historical Monuments of Roxburghshire. 2 vols. Edinburgh: HMSO. RPS. Records of the Parliaments of Scotland, http://www.rps.ac.uk. TA. Accounts of the Lord High Treasurer of Scotland, ed T Dickson, J B Paul et al. Edinburgh, 1877-. Weir, M 1988 Ferries in Scotland. Edinburgh: John Donald.